We’ve all heard the stories. Drones accidentally killing American citizens, drones gathering your online information without your consent, drones photographing your home. It seems Big Brother really is watching us. But it’s not just government who can use drones to spy. Last year, a woman in Seattle was horrified to discover that two men had been watching her get dressed in her 26th story apartment via a drone camera. 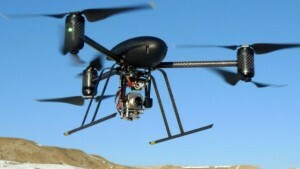 If you care about your privacy, take note of these ways to avoid drone spying in your area! 1. According to the technology-focused Boy Genius Report blog, by entering your home address on No Fly Zone Inc.’s website, you can make your land a protected space from personal drone use. Participating drone companies have agreed to keep locations listed in the No Fly Zone database free from surveillance by their companies’ drones. 2. Invest in a Cybord Unplug. This small router-shaped device can protect your Wifi and iCloud information by sending de-authentication signals to hackers and drone spies if they try to access your network. Not only does this device ward off potential threats, it warns its user by flashing, making an alarm sound, and/or sending the user a text. Besides drones, this device can protect against Google Glass hackers and those annoying neighbors who always try to steal your Wifi! 3. Investigate your state’s privacy laws regarding drones and try to pass some of your own. I was appalled to discover that in my birth state of New Jersey, the government does not need a warrant to collect personal information via drone surveillance. They don’t even need a probable cause!